The ZVOX SB500's stylish aluminum cabinet encloses three high performance speakers (including a center speaker), two powered subwoofers and a 140-watt digital amplifier. The ZVOX MegaBass system uses advanced digital contouring to deliver astonishing bass from the slim (3.2”) cabinet. 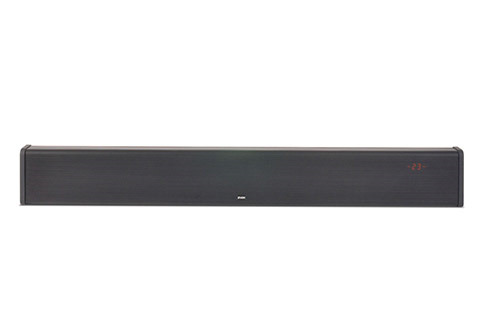 Unlike most sound bars, no external subwoofer is required. PhaseCue® virtual surround creates three-dimensional home theater sound from one cabinet. And the revolutionary AccuVoice® system uses hearing aid technology to deliver incredibly clear voices – on movies, TV shows or sporting events. Output Leveling tames loud commercials. aptX Bluetooth provides wireless connectivity with your phone or tablet so you can stream music through the SB500. It’s easy to program the SB500 so it will work with virtually any remote control. If you want a home theater with superb sound quality, designer styling and state-of-the-art features, the SB500 is the perfect choice. The SB500 can be placed on its "back" in situations where space is at a premium. In this installation the LED display is replaced with an LED indicator light. Works well with TVs from 50 ”- 90”. Great Sound. The most important feature for any home theater system is high quality sound. The SB500 uses three high-performance speakers, two built-in powered subwoofers, an acoustically stable aluminum cabinet and a 140-watt Class D digital amplifier to create warm, natural sound and surprisingly powerful bass. Uses your Remote Control. The SB500 can be programmed to respond to your remote control. The illuminated display walks you through the process in less than a minute. Then your TV remote or cable box remote or satellite receiver remote or any remote can control volume, mute, and power. Taming Loud Commercials. If you've ever been blasted out of your chair by a too-loud commercial, or by a cable channel that's twice as loud as another channel, you'll love the Output Leveling (OL) feature on the ZVOX SB500. Just push the 'OL' button and a sophisticated compression system takes over, making soft sounds louder and loud sounds softer, so there are fewer jarring moments when switching channels or when commercials come on. Adapts To Multi-Zone Wifi Audio. The SB500 has multiple inputs so you can easily connect audio devices in addition to your TV. For example, connect a Chromecast® Audio device (optional, not included with system) and you can use the SB500 as part of a multi-zone wifi audio system. Plus it has built-in Bluetooth wireless streaming from your phone or tablet. Clear Voice Reproduction. Do you ever have trouble understanding voices while watching a TV show? Then you’ll love the AccuVoice feature on the SB500. It uses hearing aid technology to tailor the sound so voices are crystal-clear. No other system matches the voice clarity of AccuVoice. Slim Aluminum Cabinet. The SB500 features a stylish, slim cabinet constructed of anodized aluminum – not plastic. The metal design provides low-resonance audio characteristics, and allows the SB500 to produce room-filling sound while maintaining a slim cabinet depth of 3.2 inches. MegaBass. The new ZVOX MegaBass feature uses digital processing to tailor sound and control the subwoofer to a degree never before achieved. The result is robust, accurate bass – down to 42 Hz – without an external subwoofer. You won’t believe it…until you hear it. Bluetooth Streaming. The system uses an aptX Bluetooth receiver to stream high quality music wirelessly from your phone, tablet or computer. Play iTunes, Pandora, Spotify or other music formats wirelessly through the ZVOX system. 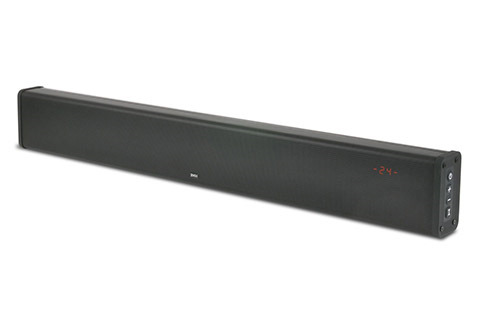 We have no downloads available for the ZVOX Sound Bar SB500 at this time.